First consider the elliptical orbits described in Kepler’s first law. Figure 13.18 shows the geometry of an ellipse. The longest dimension is the major axis, with half-length a; this half-length is called the semi-major axis. The sum of the dis-tances from S to P and from S to P is the same for all points on the curve. S and S are the foci (plural of focus). The sun is at S (not at the center of the ellipse) and the planet is at P; we think of both as points because the size of each is very small in comparison to the distance between them. There is nothing at the other focus, S.
The distance of each focus from the center of the ellipse is ea, where e is a dimensionless number between 0 and 1 called the eccentricity. If e=0, the two foci coincide and the ellipse is a circle. The actual orbits of the planets are fairly circular; their eccentricities range from 0.007 for Venus to 0.206 for Mercury. (The earth’s orbit has e=0.017.) 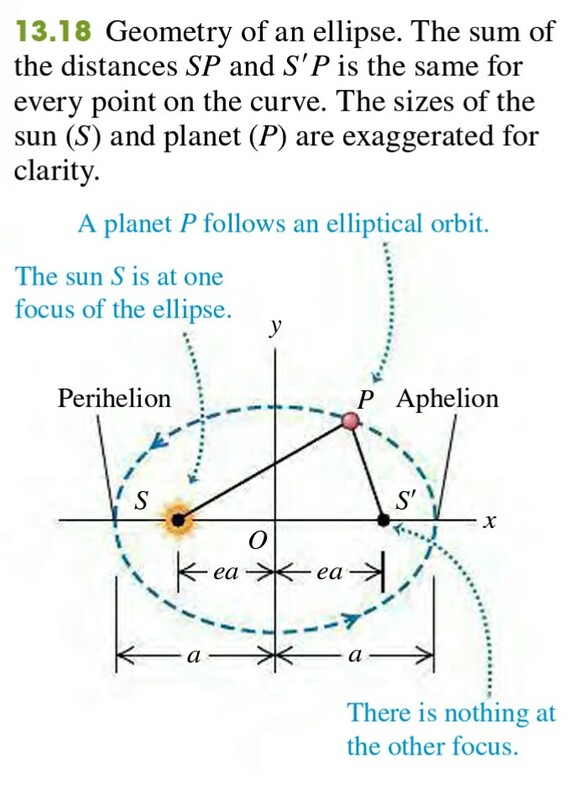 The point in the planet’s orbit closest to the sun is the perihelion, and the point most distant is the aphelion. Newton showed that for a body acted on by an attractive force proportional to 1/r2, the only possible closed orbits are a circle or an ellipse; he also showed that open orbits (trajectories 6 and 7 in Fig. 13.14) must be parabolas or hyperbolas. These results can be derived from Newton’s laws and the law of gravitation, together with a lot more differential equations than we’re ready for.